We’d love your help. Let us know what’s wrong with this preview of Still Rocking by A.D. Herrick. I didn’t expect to fall in love with Nina Mikhailov. I didn’t expect the quiet timid girl that used to follow us around like a lost puppy, while we were visiting family in Russia, to have changed from an ugly duckling into such a magnificent swan, to steal my heart fully and completely. I had no way of anticipating her coming into my life and snatching my heart straight ou I didn’t expect to fall in love with Nina Mikhailov. I didn’t expect the quiet timid girl that used to follow us around like a lost puppy, while we were visiting family in Russia, to have changed from an ugly duckling into such a magnificent swan, to steal my heart fully and completely. I had no way of anticipating her coming into my life and snatching my heart straight out of my chest. I had no way of foretelling any of this, but somehow, it happened. I was a mega star rocker traveling the world, a different girl in every town, with no intentions of sticking around for more than a good time. I was a walking hard on eager to dip my wick in just about any girl that was willing. I was the player of all players - until one day I wasn’t. All of that changed in the blink of an eye. When Nina shows Ivan her true colors. To ask other readers questions about Still Rocking, please sign up. I didn’t expect to fall in love with Nina Mikhailov. I didn’t expect the quiet timid girl that used to follow us around like a lost puppy, while we were visiting family in Russia, to have changed from an ugly duckling into such a magnificent swan, to steal my heart fully and completely. I had no way of anticipating her coming into my life and snatching my heart straight out of my chest. I had no way of foretelling any of this, but somehow, it happened. The pain. The love. The excitement. The comedy. This book had it all. It picks right up where book 4 leaves off. Man, I just be wanting to jump through the book and give the guys a hug sometimes. I love how the author keeps up with all pf the characters. Man, Nina makes me wanna slap a b****!!! Skallywag. Anyways! My heart warms up afterNINA and then Heather is just the best. Then my Damon! My poor Damon. I am so content with his heart healing. These skallwags aren't loyal. I am happy about his The pain. The love. The excitement. The comedy. This book had it all. It picks right up where book 4 leaves off. Man, I just be wanting to jump through the book and give the guys a hug sometimes. I love how the author keeps up with all pf the characters. Man, Nina makes me wanna slap a b****!!! Skallywag. Anyways! My heart warms up afterNINA and then Heather is just the best. Then my Damon! My poor Damon. I am so content with his heart healing. These skallwags aren't loyal. I am happy about his HEA. This book was everything. It filled my heart. Makes me wonder now that all is said and done... Will there be a Book 6???!!! I can't say enough good things about A.D. Herrick as an author in this genre. I've read a number of her books and enjoyed them all. 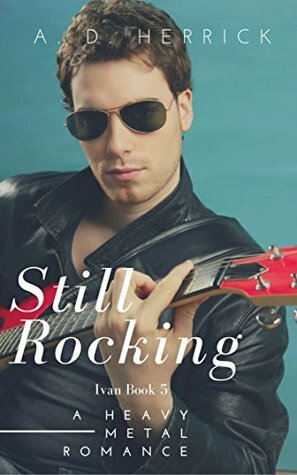 I read Still Rocking in one sitting. I don't know of any other female author who can write a first-person book from the male perspective and get it right the way she can. A.D. really does a terrific job with story line and character development, as well as hot romance, which seamlessly fits into the story without seeming gratuitous. Pick this one up. It's awesome. This was a great book. New relationships beginning, old ones ending and new babies. I love the crew of Slava Pasha and this book did not disappoint. The characters are great, the plot was awesome, the writing is great (there are a few editing issues, but they don't detract from the overall story). Great job A.D. Herrick!! Hey everyone! My name is A. D. and I write those dirty romances you can't help but love. I'm a southern girl that loves to read and check out smoking hot men! Yeah, I said it. I love objectifying men. When I'm not ogling the goods you can find me with a book in one hand and a cup of coffee in the other. Coffee is the stuff of gods! If your looking to follow me closer you can find me on FB, Instagr Hey everyone! My name is A. D. and I write those dirty romances you can't help but love. I'm a southern girl that loves to read and check out smoking hot men! Yeah, I said it. I love objectifying men. If your looking to follow me closer you can find me on FB, Instagram, and twitter. I wont lie... Sometimes it gets weird.